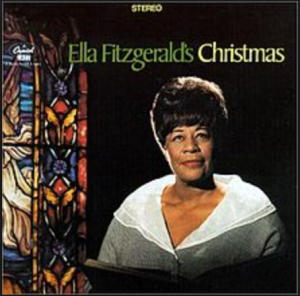 Recorded July 17 and 18, 1967 and released later that year, this is the second and final Christmas album Ella Fitzgerald ever recorded. Unlike its predecessor, which was almost entirely secular, this album features carols that can all be traced to religious roots. The album runs just shy of a half-hour in length. Almost all the songs are familiar with just one track standing out as one I haven’t found anywhere else. “Sleep, My Little Jesus” is a nineteenth-century hymn tucked on this album’s B-side. The song doesn’t pop up anywhere else in my somewhat extensive collection of classic Christmas recordings nor in my preliminary online research of major recording artists’ holiday albums. The words were written by William Channing Gannett, known as “the father on American Unitarianism,” who put them to paper in 1882 for a Sunday School in St. Paul, Minnesota. Here they’re set to a lullaby composed by Adam Geibel. Modestly holding a hymnal in front of a stain-glassed window, you might just imagine Ella Fitzgerald recording this album in the balcony of a church. Most tracks are arranged with sparse instrumentation. There could be a piano or guitar, sometimes a choir, but when a full orchestra is involved, it’s ever so respectfully placed in the back so the First Lady of Song may shine. The original LP release features 13 tracks accompanied by Ralph Carmichael’s Chorus and Orchestra, but curious listeners can also find a 2006 digitally remastered release that tacks on 14 additional spiritual tracks which have no particular connection to Christmas. If you’re looking for light background music while you do your holiday baking, decorating, or just relaxing, Ella Fitzgerald’s Christmas could be just the right fit.